How many times did you hear people describing Ahmad Al-Assir as a “funny guy”, or “He talks the reality about Hezbollah”, or “Leave him in peace, he is harmless”? How many times you gave him credits JUST because you disagree with the politics of Hezbollah, Bachar El Assad, Michel Aoun or the March 8th movement? How many times did Ahmad Al-Assir trespass the red line in many of his speeches and no one raised his voice to stop him? Again, i will tell you this Mr.Charbel, you were brought to this government because all the big decisions makers in Lebanon didn’t want a strong person to rule this ministry. You failed in most of the sensitive issues that happened in Lebanon. You used to call Al-Assir on his mobile asking for a truce, instead of arresting him. You managed the clashes in Saida and Tripoli like a school supervisor, away from any sharp-cutting decisions. Every time you tried to find a soft solution between two conflicting sides, you were indirectly admitting their presence and giving them time to reinforce and come back stronger. I just wish you knew the limits of your capabilities and refused this position earlier. Even Ahmad Al-Assir tested your skills, he provoked the Shiaas in Saida and Christians in Faraya Kfarzebian just to see your reaction and unfortunately he succeeded in overcoming your prerogatives. Ahmad Al-Assir would have remained a tiny Sunni cleric in Saida if it wasn’t for the media. This person who only had two followers became a TV Star when all the main Lebanese channels gave him airing time more than he deserves. LBC, Future TV, OTV, Al-Jadeed, NBN, MTV, Al-Manar, Tele Liban, and many other Arab channels showed us live coverage of this cleric riding a bicycle, shaving his head, blocking roads, making anti-Hezbollah speeches, etc… MTV Lebanon was the only channel that understood that Al-Assir should not be given such importance and restrained from hosting him or covering his lame stories anymore. The Hariri clan couldn’t ask for a better religious person that can publicly attack Hezbollah, and attract many followers with his anti-Shiaa speeches. They allowed him to grow in Saida without any reaction from MP Bahia Al-Hariri or Fouad Seniora, they let him gain popularity where they failed to do so, thinking they both share the same political views. Ahmad Al-Assir clearly admitted that he was supported by the state of Qatar. His several visits to Doha allowed him to get the military equipment along with funds to pay his followers. The same countries dropped any collaboration with other Sunni figures in Lebanon to exclusively back Al-Assir. The infringements taken by the party of God regarding the Syrian conflict were the perfect excuse for Al-Assir to grow. He even responded to Hezbollah’s involvement in Syria by going to the Syrian city of Qusair, a way to show his expanded force and recruit all the anti-Al-Assad individuals under his movement. Nonexistent. 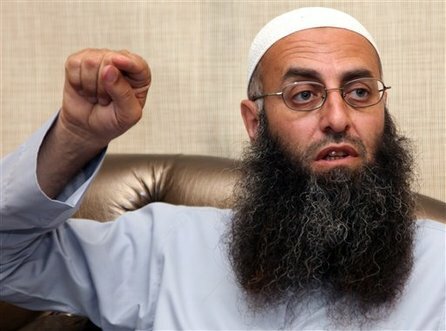 With two active prime ministers, no government, no parliament, no elections, no constitutional council and a president with limited power, Ahmad Al-Assir was given the freedom to say, act, react, and provoke the way he feels like; not even fearing the Lebanese Army or the Internal Security Forces. My only thoughts goes to the Lebanese Army that is put in a very awkward situation without any support and is still counting martyrs. Yes, you are all guilty. Guilty for not removing on time a malefic plant that grew on your Cedar tree. did u forget that claude abou nader hendi made a whole ”te7kik” episode on al assir ?? They showed ppl the ”human” side of him, how he plays with the kids and how he raise pigons … They even showed him freeing a pigon on slow motion ! True. However you forgot to mention the Lebanese Army itself who allowed him to insult its leaders and soldiers, waiting for a political cover. If they didn’t treat him as a peaceful person yesterday, they would have been more cautious and avoided the murder of the 3 soldiers. Let everyone understand that the LA doesn’t need any political cover when it comes to its image, morale and people’s security. As far as I remember, the LA had never taken radical decisions treating those issues after 1990. Let’s remember together Sobhi Al Toufayli: he’s free and always exposed to the media, Donniye terrorists: the deal of getting them out of jail along with Samir Geagea, Shaker Al Absi: our president secured him smuggling out of Al Bared, the 2 drunk cheikhs of Kuwaikhat: they arrested the soldiers; Pierre Machaalani and Khaled Zahraman’s murder in Arsal: where is Ali Houjairi? and finally Ahmad Al Assir: where is he? Let’s wait and see. in plus he is cheikh so maybe it is easier for him to escape! What about us, the people of Lebanon, who are guiltier than all? what about accepting our civic responsibilities and duties, and not voting again and again for all above mentioned people and institutions? what about condemning the media and their propaganda of fear and hate on all sides and just stop watching/listening to said media? Before blaming everyone else, I accept my failure and it hurts but I am guilty. We are the first and the last ones responsible. It is really time we wake up and act. The main objective of Al Assir was to keep some security, which in minimal, from the different militias in Lebanon. No one can deny that for more that two years his main goal was to have a strong army, and make the weapons only with the Lebanese Army. What happened yesterday was not a coincidence and for sure nothing justifies the death of any Lebanese soldier and it’s not the time to justify any mistake. Al Assir was saying what politicians didn’t dare to say. He had a very loud voice. His main objective was to have a safe country, and let the weapons only with the Lebanese government. Very well said, but is he the only malefic plant on our cedar tree? Isn’t there a much bigger plant, or should I say tree that is replacing (or trying to? Not sure at which stage we are!?) our National Symbol Tree, and isn’t he nurturing on all the awkward situations we’re putting ourselves into?!!! Totally agree! shame, shame and shame…. I can’t find out if this article is signed. Is it? Hello .Who is behind all this. Was it planed and packaged all in all .Or was it a time chance ,or choice he has, as a cover present from a power .I don’t think he is witty enough to do so. if it was not planed for him. I think he is just a muppet. Grow up you Lebanese and be free not to be lead by who ever have the difference between religion. Kullana muslimoon le Rab al3alameen.Mina man Aslama Bil Injeel waMinna man Aslama Bil Quran wa mina man Aslama bil Hikma.Wa Laisa lana 3adouwan fi deenana wa Ardina ILLA ALYAHOOD..God Bless. When Al Assir spoke live on TV and said: every 5 people should gather each other, make a secret group, buy weapons and train. our so called leaders didn’t make a comment, their only concern was the elections and how to get more privileges.